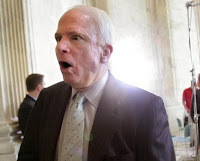 Vietnam hero, US Senator, and possible crazy, John McCain has bet his White House hopes on those who ran the Straight Talk Express off its tracks in 2000. The Washington Post has an interesting read on these guys and the launch of "McCain 2.0." Russ Schriefer spent the first few weeks of 2000 driving around New Hampshire with a digital camera and a singular mission: finding a way to discredit John McCain with voters in the state's upcoming primary. The soft-spoken Schriefer now heads the media team for McCain, the man he helped Bush defeat seven years ago. Schriefer jokes that their current candidate is new and improved. "We call him McCain 2.0," he says. "We've gotten some of the bugs out." Maybe Louisiana Political Dinosaur and McCain 2000 "War Room Czar", Roy Fletcher, was one of the bugs that was fixed. Apparently, You Tube has replaced the Pterodactyl Player. Sorry, Roy.